JUST LIKE WATCHING BRAZIL -- champion jockey Silvestre De Sousa, who hails from Brazil, will be gunning for lots of winners at Ascot and Goodwood. As busman’s holidays go, there can be few better than ones that take in the midsummer delights of Ascot and Goodwood. For as many years as I can remember, I have been decamping to the south for King George weekend at the royal track, swiftly followed by five days of Glorious Goodwood (now branded as the Qatar Goodwood Festival). 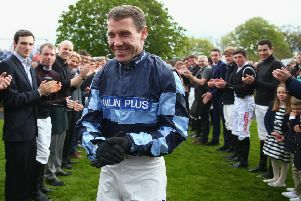 With the exception of the Cheltenham Festival, it is the intoxicating highlight of the racing year for me. I know many other racing lovers from the Derbyshire, Nottinghamshire and Yorkshire area love to spend a few days on the coast to lap up the delights of Goodwood. And who can blame them? An afternoon’s racing on the Sussex Downs is an unbeatable experience. But like any other old meeting, such a marathon needs a few winners to help it go swimmingly. So to help you along the way, I’ve compiled a potted guide to the nine big races set to grace the rest of July. It contains the key stats and trends to concentrate on, plus one or two long-range fancies that appeal for each race at this stage. One of several high-quality big-field 7f handicaps that light up Ascot’s Flat season, but one that has been dominated by 4yos and 5yos, particularly those proven over the trip. Ten of the last 12 winners were officially rated between 95 and 106, while eight of the last 11 ran at Royal Ascot. Saturday’s renewal looks as tight as ever and while LIBRISA BREEZE will have his supporters, the fast ground is unlikely to suit, especially dropping in trip. Keep an eye on HOLD TIGHT for Godolphin and CAN’T CHANGE IT for David Simcock, who could bounce back after disappointing efforts last time. One of THE great races on the racing calendar, even if it doesn’t quite boast the lustre of yesteryear. Only as recently as 2003, the race’s strength in depth was such that John Oxx’s winner, Alamshar, beat the likes of Arc runner-up Sulamani, Derby winner Kris Kin, St Leger winner Millenary and other proven Group One stars such as Falbrav, Warrsan, Nayef and Grandera! Saturday’s renewal is more likely to yield a top-class winnerr than a hot race, with POSTPONED odds-on to repeat last year’s success. But curiously, Roger Varian’s 5yo would need to break a trend lasting 12 years that says the race goes only falls to 3yos or 4yos. Aidan O’Brien’s under-rated globetrotter HIGHLAND REEL sits in prime spot for an upset. One of far too few high-ranking 7f Group races in the UK, the Lennox is invariably won by a horse aged three to five, proven over the distance and seen in action at Royal Ascot. DUTCH CONNECTION is long overdue another big prize, unlike Hugo Palmer, who could bag one even so via talented trailblazer HOME OF THE BRAVE. RIBCHESTER would be a shoo-in if re-routed from the Sussex Stakes, but Richard Fahey could have a very able substitute in BIRCHWOOD, who is returning to his crack 2yo form. Don’t rule out WASHINGTON DC either if he steps up from sprint trips. The highlight of Goodwood week promises a captivating re-match featuring 2,000 Guineas-winning trio GALILEO GOLD, THE GURKHA and AWTAAD. All fit the key trends which suggest you want a Group One miler, who hit the frame at Royal Ascot and is in the first four of the market. But which of them will prevail is open to long debate over a pint or two in a West Sussex countryside pub. Personally, I still think The Gurkha is the pick, but it also wouldn’t surprise me if RIBCHESTER improved past them all. Three-year-olds, fillies and horses carrying penalties are ones to avoid in this historic contest for stayers. The tough and likeable BIG ORANGE is fancied to make it back-to-back successes, but John Gosden’s FLYING OFFICER, Willie Mullins’s MAX DYNAMITE and Sir Mark Prescott’s PALLASATOR look poised to restore their reputations after failing to last home in the Ascot Gold Cup. Hold your bets until the draw has been made for this annual treat because ten of the last 12 winners have come from a gate no higher than eight. Most also had a mark of between 92 and 106, were aged three or four and finished in the first five last time. But only two of the last 29 victors were favourites or ran in the Royal Hunt Cup. DONNCHA must surely win one of these handicaps soon. FRANKLIN D will be backed after bolting up at Newmarket on Saturday. CELESTIAL PATH is a less obvious, but more tempting, candidate. Speed is of the essence in a sprint bossed by 5f specialists who contested the King’s Stand. In the likely absence of the Royal Ascot race’s winner, PROFITABLE, the likes of COTAI GLORY and GOKEN must be on the shortlist. MUTHMIR won’t have the penalty he shouldered to victory last year and although 3yos have a poor record, MARSHA is emerging as the fastest filly on four legs. A clash of the generations in one of the best fillies’ races all season, but notable this year for the return of Aidan O’Brien’s superstar, MINDING, for whom defeat would repesent a major shock on all known trends as well as form. If there was to be a shock, BEAUTIFUL ROMANCE is not to be under-estimated after failing to mix it with male rivals at Royal Ascot. The race-profiling is strong for the dramatic cavalry-charge that brings the curtain down on Goodwood. Look for a 6f winner, aged four to six, rated between 95 and 104, with a maximum SP of 14/1 and a minimum draw of ten. All the rage will be Dandy Nicholls’s ORION’S BOW, who cantered to a five-timer last week virtually on the bridle and won’t be anchored by a 6lb penalty. Three-year-olds rarely prevail, but Magical Memory managed it in 2015 and among this year’s crop are the very smart duo of Roger Varian’s TANEEN and William Haggas’s RAUCOUS. One of my pet-hates in racing is commentators and TV pundits referring to a horse as ‘it’ when a colt or gelding should be ‘he’ or ‘him’ and a filly or mare should be ‘she’ or ‘her’. At best, it smacks of lazy research. At worst, it is a disrespectful slur. Therefore, what a refreshingly contrasting comment Derbyshire man Richard Courson came up with at the weekend after MRS DANVERS, a filly owned by a syndicate that he is a member of, had won the valuable Weatherbys Super Sprint. “Today was the first time I have met the horse and she’s such a wonderful filly,” he said. Visions of Mr Courson shaking hands with Mrs Danvers as they greeted each other at Newbury reflect the bond all in racing should have with horses. They are not human beings, but neither are they mere objects within our little betting bubble.